Crews from Broward Sheriff’s Office are investigating an explosion late Saturday night outside a Lauderdale By The Sea restaurant. Just before midnight, the owner of Giannino Italian Restaurant – located off Commercial Blvd. and Poinciana Avenue – locked up the building and was on his way home when he heard an explosion. The owner thought it was fireworks and continued driving, while BSO officers responded to the scene after calls of an explosion and found a device in front of the store. 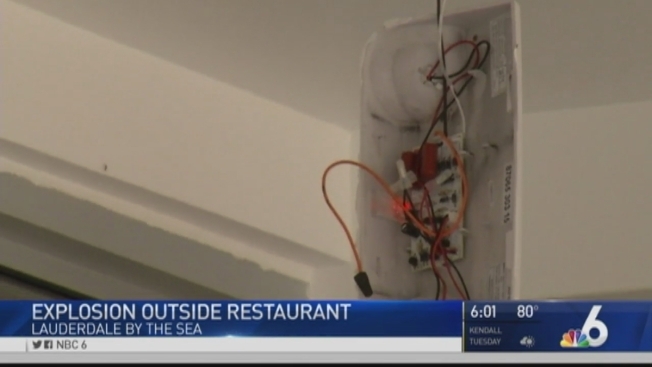 "I'm glad no one was here when it happened," employee Pietro Di Costanzo told NBC 6. No one was injured and the investigation continues into who placed the device there. The restaurant owner says he’s devastated that someone targeted his business, let alone on the Christmas weekend. Although they did receive some dinner cancellations, loyal customers are offering him support as they stumbled across the damage Sunday morning. The family owned restaurant has been in business for six months and are now relying on their new community's support for answers. “Someone saw something. Please report it to the police so we can discover who made this,” said Pietro. Anyone with information is asked to call Broward CrimeStoppers.